﻿ We had a good crowd for First Friday. Wonderful paintings by Sally Moser and of course the deeeelicious appetizer bar prepared by the ever creative Andrea Stone and her staff. 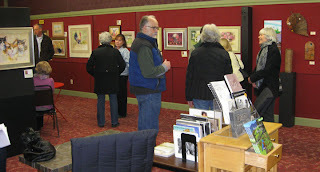 People enjoyed visiting all the great showings at the other galleries in downtown Baker City. Fun evening, great art. There is a lot of talent in this town. the gallery looks great! See you in June!